We at Infer have created an AI & predictive analytics platform that helps businesses increase productivity, reduce waste, and grow revenue with the power of data science. Our solution addresses the common pain point of identifying which leads, contacts, and accounts are most likely to close by analyzing historical data to generate a predictive model for each customer’s use case. The end result is a powerful tool to help businesses connect with customers and get ahead of the market. Here’s how we did it. Too Many Prospects – We have too many inquiries coming in the top of the funnel. How do we filter and prioritize to make sure that we are spending time on the best prospects? Which are the best fit to buy? Too Few Prospects – Are there more lookalikes? Where do we find more accounts and contacts that look like my best customers and are not currently in our CRM? Missing Opportunities – Which prospects are most engaged? Who is ready to buy? And when should I reach out to them? Unclear Segmentation – Who is my ideal customer? How do I build, identify and then target this persona or segment of customers across my entire sales and marketing stack? For most of our customers, these challenges were compounded by the lack of communication between their system of record (CRM) and system of delivery (Marketing Automation). The two systems were not talking to each other, contained duplicative entries, and in many cases, had dirty data. In 2010, Infer introduced a “system of intelligence” to the B2B sales and marketing stack that sat across these systems, giving marketing and sales leaders an objective and quantitative way to measure the value of each prospect across their funnel using just a website, company name, or email address as the mechanism to generate a predictive score. Specifically, we found that predictive models allow marketers and sales reps to more efficiently spend their time on activities that drive revenue, rather than qualifying prospects one-by-one. For marketers, Infer helps identify the top performing marketing channels and qualify prospects the instant they enter the sales funnel. For prospects already in the funnel, Infer monitors their engagement levels and alerts teams when that prospect is ready to move to the next buying stage. For sales reps, AI helps filter and prioritize target account lists based on those with the highest probability to convert into customers. Infer can also identify buyers from those accounts as they enter the system and ensure that they are shepherded to the appropriate stage of the buyer’s journey. Beyond its predictive capabilities, Infer aligns stakeholders across the organization on a single understanding, rooted in data science, on the fundamental attributes of a good prospect. We are excited to be partnering with Microsoft to launch our predictive sales and marketing Dynamics App on Microsoft AppSource. This new app helps expand the predictive sales and marketing functionality that addresses so many of these critical pain points to the Microsoft Dynamics ecosystem. In addition to supporting Microsoft Dynamics data in its predictive modeling, Infer incorporates thousands of technographic and firmographic signals from its proprietary data cloud as well as data from Microsoft Dynamics 365 (which store sales data) and marketing automation systems such as Marketo (which store user-level data on website engagements and email interactions). When combined, these multiple data sources provide predictive models that can help solve the common sales and marketing challenges outlined above. Beyond automatically qualifying every lead than enters your CRM, Infer also integrates with Microsoft PowerBI, allowing you to gain insights about the health of your sales and marketing funnel, as well as marketing systems such as AdRoll, Marketo, and Hubspot allowing for advanced campaign orchestration. Infer’s predictive platform can also seamlessly connect with any other system via open REST application programming interfaces (APIs). To close the loop with reporting capabilities, Infer delivers its predictive intelligence to analytics systems like Power BI to drive transparency through next-generation sales and marketing management reporting. Here’s a look at some of the key capabilities of Infer’s AI application. Personalized models look at historical DynamicsCRM data and Infer’s vast library of external signals to identify which prospects are the best fit for a company’s product. 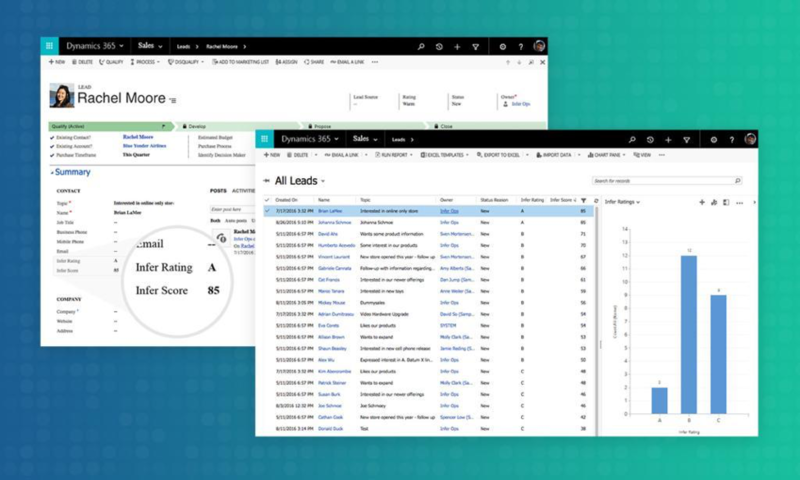 Predictive scores are then added onto customer records in Dynamics 365 for Sales to help increase sales productivity through better prioritization, streamlined workflows, and more informed decision-making. Infer’s recently launched sales analytics package for Microsoft Power BI delivers powerful visualizations and key insights that dramatically boost sales and marketing performance. With this valuable intelligence, Microsoft customers can produce accurate sales forecasts and analyze their pipeline to find hidden gold. To learn more about how Infer can help improve your sales and marketing efficiencies, visit us at www.infer.com. How do you see a more data-smart marketing and sales effort driving your business forward in the coming years?